Henry Holiday’s stained glass in New York. Last year we were in New York for the day (!) and having made arrangements before we left home, we paid a visit to Episcopal Church of the Holy Trinity at 316 East 88th St in Manhattan. We went because Peter Cormack, writing in the catalogue of an exhibition of Holiday’s work held in 1989, quotes Holiday as saying that he regarded the crucifixion and ascension windows here as his finest glass. What Peter didn’t say was that these were just two of a set of SEVENTEEN windows in the church all of which were designed by Holiday and installed between 1898 and 1929. 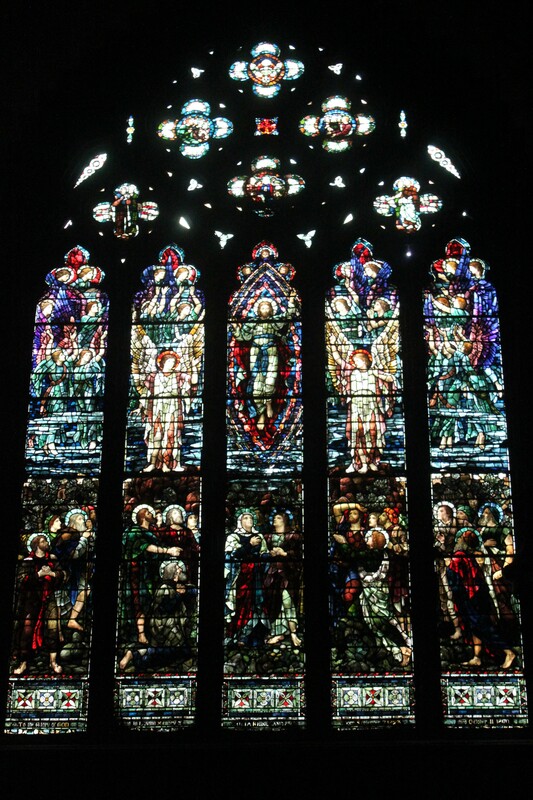 The last, the 5-light west window, was installed 2 years after Holiday’s death. It is a visit well worth making if you have time to spare in the Big Apple. North transept, Holy Trinity Church, New York. The Ascension by Henry Holiday. Not the best of our photographic efforts but not bad in the circumstances! 212-289-4100, ext 201 for access.